eMail isn't quite dead as a marketing tool just yet. It is re-shaping itself, becoming more intelligent, getting mostly automated, and emerging as a nice little 'responsive' and 'creative' marketing tool for brands. 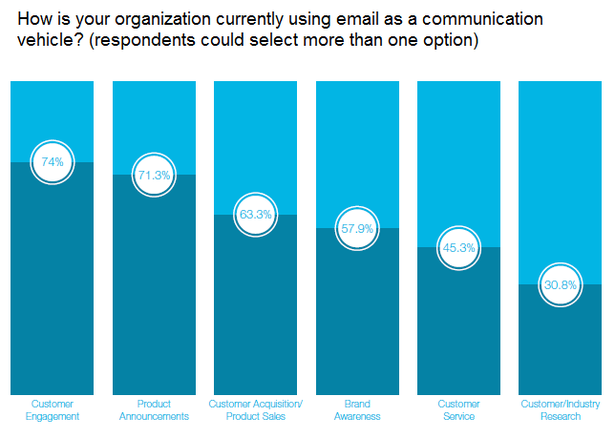 In a recent global survey done by Lionbridge we get some interesting stats and feedback from brands that use email. Nearly 80% of those surveyed said they use an automated system to send out email campaigns. But surprisingly, nearly half of the audience polled said they had no clear calendar of mail send out strategy. Because only around 16% use email as a stand alone activity, this is not surprising at all. eMail today is usually a strategically used part of a larger mix – working closely with other online and social media marketing. With such a large percentage of mails today being received and opened on mobile, it was quite a surprise to notice that most brands that use email, less than 50% were sending out "responsive" mails or had a device compatibility focus. This will need to change. Increasingly, emails that are hard to read on a handheld device are not going to be read, or even in case of drip feed mails, be opened the next time. Global brands often rely on global content about their products or services for email campaigns. This means that there is very little 'regional focus' or 'localization'. This almost asks for failure as the regional or local context goes missing, and the relevance disappears. We do need to focus on 'subject line' for email campaigns as that is the one sure key to a better open rate. The better rafted the subject line, the better the email has a chance of an open, and engagement and response. Crafting email copy is a tough job, but crafting that must open subject line is even more difficult. Brands are using email for customer engagement, product announcements, sales, customer acquisitions, building brand and product awareness, and often for customer service. Used properly, email remains a highly customized, personalized vehicle of communication, that can be automated to a high degree and used well in a balanced marketing mix. It's in the crafting, formatting, designing of the email content that success or failure lies. And of course, in who is receiving it. The database of names and addresses with hyper targeting built into it is key. After that it's a simple message to the consumer... 'You've got mail'. This is an interesting post on email. At our (small) company we use email as a key marketing tool, but you are right, it is the subject line that does make the difference. We always put something in the subject line that calls for attention. Not an offer, but value adding in the recipient's context. Sadly, we are not yet into super customized email like you have mentioned.